Use the links below for each otter common name to view the species information. Although all are rather similar in appearance, otters exhibit striking behavioral and social variations. In most species numbers are rapidly declining, through direct persecution by man, and indirectly because of loss of habitat. Otters are the only truly amphibious members of the weasel family. They largely forage in water, but are equally at home on land, except for sea otters, which in California rarely come ashore. Otters' tightly packed under fur and long guard hairs are water-repellent, and the body is elongated, sinuous and lithe, built for vigorous swimming. The limbs are short and the paws are webbed in most species. The forefeet are shorter than the hind feet. The tail is fully haired, thick at the base and tapering to a point, flattened on the underside and in some species on the upper surface. There are numerous stiff whiskers around the nose and snout, and in tufts on the elbows. These tactile hairs are sensitive to water turbulence and are used in searching for prey. The ears are small and round, and like the nostrils are closed under water, an indication that sound is not important in the location of prey. Most otters have claws, but those without them use their acute sense of touch and their manual dexterity to find and seize prey. Otters' diets are varied, but most species eat frogs, crayfish, crabs and fish -- usually sluggish non-game species such as roach, sticklebacks or eels. Otters consume their catch immediately. Bones are crushed with well-developed premolars. Very occasionally a rogue will enter a hatchery and kill large numbers of fish. Like most carnivores, otters prey on what is readily available and the easiest to catch: in Europe on lethargic frogs and eels in winter, coots and ducklings in spring, and spawning crayfish, perch or roach in summer. Otters use different tactics to catch their prey; the Oriental short-clawed and Cape clawless otters are hand-oriented and will invariably grab an octopus or a crayfish with outstretched forepaws; on the other hand, the six Lutra species and the giant otter are mouth-oriented like most carnivores. 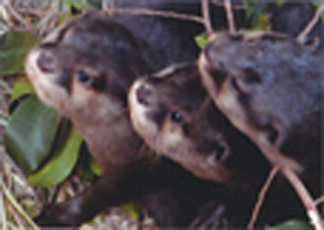 The Oriental short-clawed otter is the smallest of all otters. Its forefeet are only partially webbed and have stubby agile fingers tipped with tiny, vestigial claws that grow like upright pegs on the top of bulbous fingertips. Aptly called "finger-otter" in German, these diminutive otters use their sensitive forepaws constantly to search for prey by touch alone.